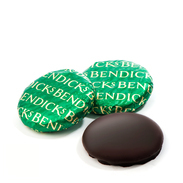 The Bendicks story began in 1930 when founders Mr Oscar Benson and Colonel Bertie Dickson produced the first ever Bendicks after dinner mint chocolates, establishing an unrivalled reputation for perfection. Bendicks is proud of its long, rich heritage dating back over 80 years as well as being known for quality and excellence. Our complete range is available to buy online through our partner, Chocolates Direct. Discover more about Bendicks on the official website. An intense finishing touch to any meal. Bendicks Bittermints, the original and most famous mint, made to the original recipe of 1931. An intense, solid mint fondant covered in thick, smooth dark chocolate containing 95% cocoa solids, a perfectly unique experience. The ultimate mint chocolate assortment. The best selection of after dinner mint chocolates, when only the best will do, our Mint Collection will never fail to impress. A selection with something for everyone. Our Mint Collection contains: Bittermints, Bendicks most renowned after dinner mint containing intense peppermint oil and 95% cocoa solids’ chocolate. Dark Chocolate Mint Crisps, distinguished by their handmade honeycomb wrapped in smooth, dark chocolate and natural peppermint taste. The best premium Mint Crisp. Handmade honeycomb, wrapped in a smooth dark chocolate infused with peppermint oil. How can you possibly resist? 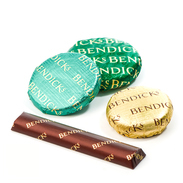 Bendicks has been renowned for delivering excellence for over 80 years and is seen by many as the best after dinner mint. We use only the highest quality ingredients for each recipe and will continue to honour its reputation for perfection for decades to come. Bendicks reputation for the finest after dinner mint chocolates was officially recognised when the company was granted a Royal Warrant, ‘By Appointment to Her Majesty The Queen’. A prestigious, Royal seal of approval that Bendicks proudly displayed on its packs and shops, confirming the quality and excellence for which they were famous. Bendicks developed an unrivalled reputation for quality and excellence, and a new store was opened in the heart of London’s exclusive Mayfair. The elite new store attracted the most discerning of customers. The company soon became famous across the globe as Bendicks of Mayfair. Lucia Benson, Oscar Benson‘s sister-in-law, develops a remarkable mint chocolate recipe. She enrobes mint fondant, which is almost too intense in taste, in dark 95% cocoa solids chocolate, which is almost too bitter, creating the world-famous Bittermint. Mr Oscar Benson and Colonel “Bertie” Dickson open a small confectionery business at an unassuming address: 184 Church Street, Kensington, London. If you have any questions or comments, we would like to hear from you so please get in touch.